Amazon.com description: Product Description: Under one cover, Frank Incropera provides a comprehensive, objective and critical assessment of all issues germane to the climate change debate: science, technology options, economic ramifications, cultural and behavioural issues, the influence of special interests and public policy, geopolitics, and ethical dimensions. The underlying science is treated in depth, but in an approachable and accessible manner. A strong case is made for the reality of anthropogenic climate change, while confronting the range of issues that remain uncertain and deconstructing opposing views. Incropera assesses the strengths and weaknesses of technology options for mitigating the effects of climate change, analyzes nontechnical factors - economic, cultural and political Ã¢ÂÂ and provides an in-depth treatment of ethical implications. 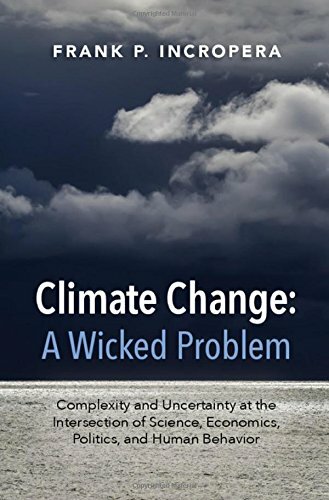 This book is intended for those wishing to become fully informed about climate change and is designed to provide the reader with a firm foundation for drawing his or her own conclusions. About: Under one cover, Frank Incropera provides a comprehensive, objective and critical assessment of all issues germane to the climate change debate: science, technology options, economic ramifications, cultural and behavioural issues, the influence of special interests and public policy, geopolitics, and ethical dimensions.